Angela is having another Bread Pudding Off on her blog which keeps reminding me of a story from my childhood. I do not like bread pudding. When I was a kid my mom made this awesome pudding cake thing where you make the dough and then you make this very thin sauce, you put the sauce in the baking dish then you plop dumplings of chocolate dough into it, bake it and you have cake smothered in pudding. It's freaking awesome. As a young elementary school aged kid, though, I didn't have a lot of appropriate descriptive skills so when I sort of vaguely explained to my mom what I wanted she obliged me by making bread pudding. It didn't seem the same going into the oven but I knew that the other thing morphed when you cooked it so I waited it out. It did not morph nearly enough. I kept trying to explain a sauce and my mother kept offering to drown the bread pudding in heavy cream which she also does with cooked chocolate pudding and which I do not like either. After much discussion (while she ate bread pudding and I did not) I was able to make it clear that I was talking about a different dessert entirely and she has never wasted bread pudding on me again. I've told you before that I explain myself much better in writing. That story might be why I learned to describe stuff. I still feel bad about the whole thing. 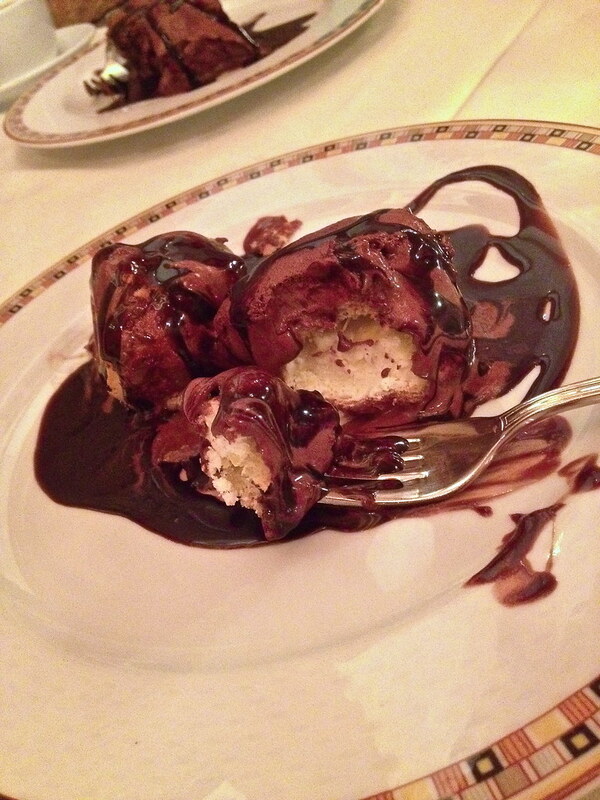 *This is a photo of profiteroles I had in Italy. They are nothing like either dessert mentioned in this post. 1. Do you have the recipe for YOUR thing? It sounds delightful. I have a recipe we used when I was a kid for a caramel pudding that may be of a similar type to the pudding cake you liked. This one has a vanilla batter with raisins in it. That is put in a greased baking dish (or casserole), then a thin sauce of water, brown sugar, and butter is poured over it. The whole thing is baked, which thickens the sauce. The cake part ends up like a somewhat heavy cake with gooey edges that have been sitting in the sauce. A piece of the cake is cut to serve, and the sauce poured over it.